Hello parents and friends, I provide a 45 - 60 minute positive live interactive concert for children ages 2 to 10. Themes include friendship, never giving up, character, feelings, and more. I include instruments, pom-poms, leis, jump ropes, hula hoops, cool sun glasses, and more. My main goal is for children and adults alike to move, make noise, and have fun together. 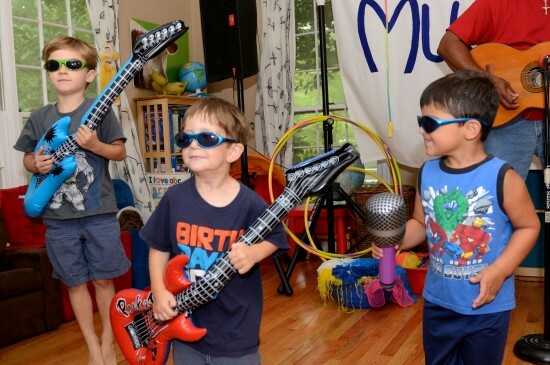 Thanks to Mr. Hyson, my daughter's 7th birthday Rock and Roll Rock star party held at our home was a HUGE success; the kids were learning, laughing, singing, and rockin'; the adults were also involved and engaged in the musical fun; Musical Fun with Mr. Hyson is a definite must for kids entertainment. Great Job! Worth it!! Thank you so much for your hospitality. The energy from the children and adults was phenomenal and the laughter and smile made it easy for me to entertain. Thanks again for allowing me to celebrate with you. Mr. Hyson was a great entertainer at my son's 3rd birthday party. He was high energy and kept the kids engaged. He also turned on back ground music for a few minutes before and after his performance which was a nice touch so it wasn't such an abrupt start and end to the show. He also incorporated some personalized requests of my son's favorite songs. My husband and I were very happy with this choice of entertainer! Thank you, Lauren, it was nice to sing "Down by the Bay", which was one of my favorites when I taught in Day Care. You have a lovely family and I thank you. Tell S. hi for me. Got him for my son's first birthday party. He was great and was the highlight of the party. Kids of all ages had fun and the parents were happy too! Highly recommend. Thank you for the words. I had a fun time as well. I really liked the bus theme. Mr. Hyson performed at our school and he was fantastic! We normally have about 80 to 100 children that attend the music shows. He had all of their attention. Not only is he a talented musician but we loved the educational fun he packed into every song and activity. Best educational entertainer by far! We have already booked him for 3 more shows! We loved having him here at the Goddard School! Thank you Bianca, I really appreciate your kind words. It was a lot of fun!!! Me Hyson was amazing he put an special touch was A great musical show. Thanks to Mr. Hyson, my daughter's 7th birthday Rock and Roll Rock star party held at little Havana restaurant was a HUGE success; the kids were learning, laughing, singing, and rockin'; the adults were also involved and engaged in the musical fun; Musical Fun with Mr. Hyson is wonderful well recommended. Thank you very much for these kind words. I think I had just as much fun as the kids. I was very happy I discovered Mr Hyson. He was incredibly engaging and his entire performance encompassed positivity, Manners, motivation, etc. He showed up early and set up an elaborate performance area. The kids loved him and had tons of fun. I highly recommend him! Thank you for your hospitality and giving me the opportunity to celebrate with your family and friends. What a delight to spend time today being entertained by Mr. Hyson!!! His Lakeforest Mall show was fantastic for my boys. He got kids and adults up dancing and singing! Loved it!!! Mr. Hyson has performed at our neighborhood block party for several years. He's always a hit with the kids. Very interactive performances. Highly recommend. And buy his cd too, for musical fun at home! Thank you Jill and tell V. I said hi. Enjoy the music!!!! My kids were so engaged. So much laughter, excitement, dancing. He got even the parents to dance. He made my 5 yr old daughter's birthday. He was very energetic. The kids loved him. The message he conveyed to the kids was so positive & educational. 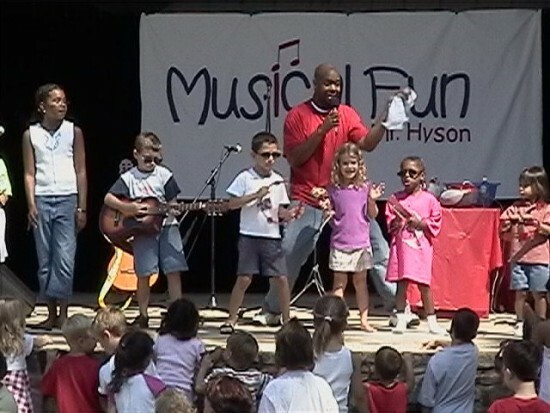 If you want your child's event to stand out, then you need Mr. Hyson. We really enjoyed Mr Hyson. He was flexible with his time and was very nice. The show was great and he somehow managed to keep a bunch of 3-5 year olds entertained for a full hour. His show had a great message. He even got the parents involved! I would recommend him to anyone who wants to have a fun party! We were looking for someone to do some music entertainment for our three year old Twins birthday party. Mr. Hyson seemed like lots of fun so we hired him. One of my boys has a tough time with new things and once he decides he wants nothing to do with it, that’s it. Well, Mr. Hyson was able to turn him around and both boys had a blast. So did all the adults and children at the party. Many of my guests commented that this was the best children’s party they had ever been to and I give him all of the credit. Thank you for making this day so much fun. I am very thankful for the opportunity to share the gift of music in the celebration of life for James and Jackson. I really appreciate all the participation from the parents as well. God bless you and your family. We had a great time with Mr. Hyson for our son's third birthday. Our son is usually shy but loves music and Mr. Hyson was so sweet and fun for the kids. Parents had a great time, too!! Mr. Hyson's songs are super cute and his props were a hit as well. You can tell he's prepared and then some - he's a real pro. We're so happy we had Mr. Hyson join us for our celebration - we're trying to think of ways to hire him again soon! I had just as much fun as the kids! Thank you for hospitality and tremendous energy. Mr. Hyson did a fabulous job at my daughter’s 4th birthday party. All the kids were engaged and had a blast. My daughter is shy but loves music, when she wasn’t quite sure he got down on the ground with the kids and spoke to her and made her comfortable. He’s a great entertainer and the adults had just as much fun as the kids! Thank you Marcie, it’s an honor to entertain and teach young children and have a positive impact on their lives. I have to say that your teachers were absolutely amazing and so were all of the children. See ya soon. Mr. Hyson fused family fun for all ages with education and inspiration! Many friends said it was the best party ever! My daughter can’t wait to have him back for her 8th birthday. Adults and kids were captivated and had a blast. Definitely the Highlight of the year!!! Thank you Mrs. Beyah-Taylor for this kind review. I had a blast as well. I especially liked your daughter's singing. See ya soon. Mr. Hyson was always very polite and professional when we spoke. He arrived on time and was set up and ready to go before my first guest arrived. He was wonderful with my 3 year old son. Mr. Hyson allowed him to help set up and talk in the microphone. My son felt important and included even though it was his sister's birthday. Mr. Hyson played wonderful music and games with the kids and made sure everyone participated. He even stayed late since most of the guests were late arriving. The kids didn't want to stop dancing to eat the food and cake even. Mr. Hyson was wonderful! He exceeded my expectations for communication, professionalism, and fun. I highly recommend him for any event. Mr Hyson put on an amazing show during mine and my son's stay at Jellystone Yogi Bear Campground in Hagerstown, MD. The show was very interactive, upbeat, and enjoyable for all ages! Some of the best fun we have had in years! Thank you Mr Hyson for being such a positive influence during our camping experience! Kathy, thank you very much for the kind review. The energy that all of you poured out made the performance that much better. Hope to see you again. Blessings. Mr. Hyson performed at our child care center for about 60 children and have every single one of them engaged and excited the entire hour. Even with limited space, he made it a memorable experience for the entire center! Thank you very much for your kind words. I had a blast as well. Mr. Hyson performed at my sons end of the year school party today at Kinhaven. He was so energetic and entertaining, all the kids (and the parents) had such an amazing time. Mr. Hyson performed for my daughter's 2nd birthday! It was a great experience, not only for the kids but for the adults. The kids had so much fun and stayed engaged the whole time. I had several parents ask where I found out about him. So happy we connected. Thanks again!! Mr. Hyson provided the entertaiment for our sons first brithday and it was a blast. He kept 15 to 20 kids (ages 1-8) and parents entertained the entire time and eager more. Hours after the kids were still singing songs from the performance. We cannot say thank you enough for making our sons 1st birthday very memorable for all..
Fun for all ages...including adults!!! We booked Musical Fun with Mr. Hyson for our 5 year old daughter's birthday. He was absolutely amazing and the kids (and the adults) loved it. From beginning to the end he had the kids engaged, singing along and there were plenty of smiles for photo ops. I thought the adults would take advantage of the break but they were just as engaged as the kids. When I clicked on the link to leave this review (I hardly ever leave reviews), the pictures reminded me of all the fun we had at the birthday party. Best of all, Mr. Hyson was prepared to make our birthday princess feel special and had a moment in his performance just for her. All we had to do was provide the cake - his show was the hit of the party!!! Did I mention the fun songs had a life lesson for the kids too??? The kids were learning and having fun and didn't even notice he was slipping a lesson in - haha! I (I mean my daughter) can't wait until next year to do it all over again. Our daughter's 1st birthday party came a live because of the performance. We really felt like we celebrated! Everyone had so much fun specially the birthday girl. She enjoyed all the music played by Mr. Hyson. I would highly recommend. Thank you so much again! Mr. Hyson provided the entertainment for our PTO sponsored Holiday Party at our Montessori school, and we all had a terrific time. Mr. Hyson was easy to communicate with, always had a prompt response, was upfront with all the details, arrived early, and there were no surprises. Especially nice when planning a party for 100! I highly recommend his show. He is a reliable, down to earth, and talented entertainer!! Thank you very much for your kind words. I had as much fun as the kids. Thank you. I hired Mr. Hyson for my daughter's 3rd birthday and we all had a blast, kids and parents alike! There were 14 kids and their parents and Mr Hyson managed to get everyone up their feet to sing along, dance and participate in the activities, it was super fun and the perfect way to make a kid's birthday party fun and original. Mr. Hyson was very professional and it was very easy to work with him. We made all arrangements via GigSalad and phone and got everything ready in no time. The day of the event he arrived early enough to set up all his equipment and props and started the show punctually. After all the fun, he got all his equipment together and left the area neat and tidy. He is very kind and courteous, kids and parents loved him. I would strongly recommend him for events like the one I had, my daughters birthday was a hit thanks to Mr Hyson! Mr. Hyson was a hit! Many thanks to Mr. Hyson for making our daughter's birthday party a hit. We had 10 month olds to 5 year olds and they all had fun! The adults also enjoyed watching and participating. It was a humid afternoon but no one seemed to care because they were too busy playing their instruments or running through hoola hoops! Mr. Hyson's original music was very clever, and you can see how much he enjoys performing and interacting with the children! Thank you, thank you, and thank you. We sure had a wonderful time. Life is precious and should be celebrated. Mr. Hyson did an amazing job entertaining children from 2 years to 8 years old with his positive and upbeat songs and his commanding performance. I would highly highly recommend him for preschool and elementary age groups and in particular for mixed age groups. We look forward to playing his music for our children on a continued basis. Thank you very much for your kind words and the opportunity to celebrate Daniel's life with you. High energy, positive message, and great original songs! Thank you very much for the kind review. The children and staff made me feel welcomed. If I can add value to other events please don't hesitate to call. Mr. Hyson was really great engaging kids of all ages! We had a mixed group of kids and all of them really enjoyed singing and dancing. The adults also had a good time! Thank you so much! Mr. Hyson is phenominal!!! A great time for all. We hired Mr. Hyson for my daughter's 5th birthday party last year and she enjoyed him so much she insisted we bring him back this year for her 6th birthday. His performance captures the children and engages them for the entire show. He is entertaining, fun, professional, super talented, and wonderful with children. I can't recommend him enough. Mr. Hyson provided entertainment for my 5 year olds birthday party and everyone had a great time. We did not have a lot of children at the party however everyone including the adults enjoyed the tunes and Mr. Hyson has a gift of getting people up and moving. Would definitely recommend him for any event with children! PS- My daughter who was very shy initially demands that I play Jack the Cat in the car over and over....love the CD! Meow...woof woof! Mr. Hyson was great. He was able to entertain all the kids at my sons party even though the ages ranged from 1-11years old. All the kids participated and had a blast. It was everything I hoped for :). Thank you Mrs. Forsett for your hospitality and warm welcome. I am gracious for the opportunity to celebrate your son's birthday. We had a wonderful experience with Leroy Hyson! He was extremely professional and great at communicating with us all the way leading up to our big event. Upon arrival, he did a very fast job setting up and immediately made all the kids welcome. We had ages 2 through 7 and he worked to make sure each and every one felt at ease. His show was extremely entertaining/engaging and all the props he brought for the kids were fantastic. We would 100% recommend him to anyone that has children with a love of music! 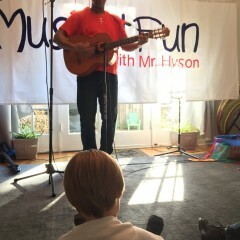 Mr. Hyson recently performed at a birthday party for our 4 yr old and 2 yr old. The kids loved him and the adults were entertained too! He was very energetic and was great about involving the kids! My son's 6th birthday party was fantastic thanks to Mr. Hyson. The kids danced, sang, tried new things, and had a blast. My son said to me, "that was sooo much fun. I'm really tired now though". I highly recommend Mr. Hyson for a great event. Mr. Hyson performed at my daughter's preschool the other day. He was so much fun! He really knows how to engage children at their level with fun song and movement. And he was enjoyable and fun for the adults to listen to -- much more so than some other local performers I've listened to. I highly recommend him. He had every kid singing, dancing and jumping around with absolute joy! children really made my day. Thanks again! Nice music entertainment at our backyard! He came to our house on time, and set up instruments in professional manner. The birthday party was held at our backyard, and there were 20 kids (age 6-10) and 7 adults. We all enjoyed his music for 45 mins. I booked Mr Hyson based on his great reviews. He did not disappoint. I booked him for my son's 4th birthday party. The scheduling process was very easy. Mr Hyson arrived on time, and was able to adapt his setup to our space. We had kids ranging from 1 to 8 at the party, and they were all engaged during the entire performance. Mr Hyson is very good with children, and knows how to get everyone involved in the activities. He has great music, and has a fun repertoire that everyone enjoyed. Fellow parents were impressed, and the kids had fun. What more could you ask for? We had a wonderful time at the birthday party. Mr. Hutson played great music and catered to the age group. Thank you so much for your kind words. I had a blast. We had the fortune of having Mr. Hyson at our daughter's 7th birthday. It was certainly a most memorable experience that exceeded our expectations. He engaged all of the kids with his music and games. We had 30 kids, ages ranging from 1.5 to 7, and we could see that they were all having a great time, singing, dancing and laughing. His songs and activities are fun, educational and energetic. His command on the kids was excellent and with a very positive and respectful approach. He was very polite and professional. He kept contact with me before the event, answering my messages promptly and helping me make sure that the logistics were seamless. It was a great choice because I could be stress-free having such a big crowd and enjoy watching my little one have a blast with her friends. I highly recommend him. We invited Mr Hyson to entertain at our 3 year old's party. We had 9 kids ranging from 1 to 12. Everybody, including parents, had a lot of fun and are still talking about the party. A couple of our guests had already asked for Mr Hyson's contact information. I would HIGHLY recommend Mr Hyson!!! Leroy! You did an amazing job! Thank you so much for deejaying my daughter's 13th birthday party and making it so memorable. My daughter was thrilled with the way things worked out. The kids are still talking about how much fun they had. We will definitely do it again! Your creative energy and rapport with the kids cannot be matched! My daughter's biggest fear was that her different groups of friends might not mingle with each other. 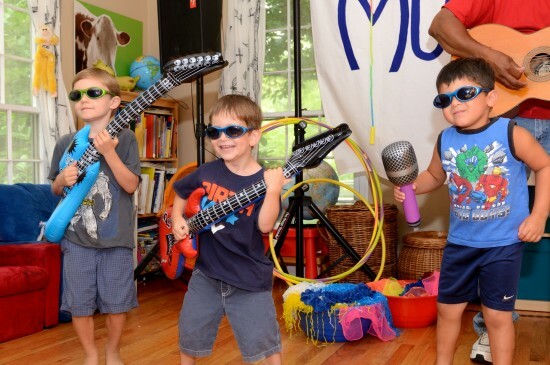 You brought the kids together with kid-appropriate music plus fun, engaging activities. A good time was had by all!! See you next time! 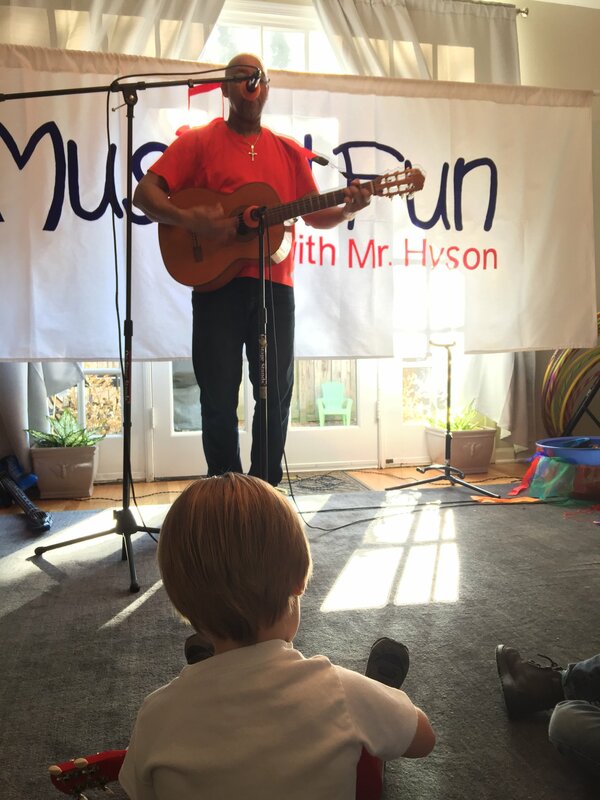 Musical fun with Mr. Hyson was the perfect choice for my daughter's 3rd Birthday party. His 45 minute show was engaging, fun, energetic and had children and adults smiling, dancing and clapping. Mr. Hyson knows kids! He had 2-7 yr olds singing along and "playing" in his band. He brings fun props and gets both kids and adults involved in the fun. Loved his music and the positive message he gives within his lyrics. Definitely a memorable party! The kids said "Mr. Hyson, please don't leave!" Mr. Hyson shows up with everything he needs and sets up quickly. A great birthday party idea if you want to sit back and relax and watch your kids have a blast! Thank you sooooo much. I really enjoyed singing and celebrating with all of you. We wanted to experience some new entertainment and were very surprised. Mr. Hyson geared his performance to the children. It was educational, engaged listening skills, music, and dancing. The children loved every minute and the parents were smiling watching their children perform. It was truly a blessing to celebrate with all of you. The love and hospitality was you gave me was heart felt. Merry Christmas and a Happy New Year! Mr. Hyson came to my daycare center to perform. He is a suburb musician, a phenomenal entertainer. He made sure that all the daycare children were included in the performance. I had a range of children from ages 2 months – 8 years old. And even the infant was jamming out to the music. Mr. Hyson found a way to make sure that there was a theme and lesson in every performance. The children laughed and had a great time. My two daughters play his music cd all the time, and dance around the house. I was so pleased by Mr. Hyson’s professionalism, his demeanor, his passion for music. You can tell he really enjoys what he does. I would recommend anyone to come and see his act. Class act! It was a great show, and I am forever thankful for the creativity, inspiration and dreams that you created here at my daycare. We won’t forget it! : ) Blessings and Good wishes Mr. Hyson! Mr. Huston came to the school I work at to help celebrate a students birthday. This school is for students with severe and profound disabilities. He was wonderful. He kept all of the students happy, smiling and totally engaged. Mr. Hyson is energetic, caring and creative. He would be a great addition to any party for young or young at heart children! Definitely recommend Mr. Hyson for your next party!! Mr. Hyson is amazing!! We hired him for our son's first birthday party and I am so glad we did .. All of the kids - of all ages - loved him and danced and sang away with him .. My son loves music so I knew he would like the show, but he was more excited by Mr. Hyson's performance than I ever could have imagined and laughed and danced along with him! Mr. Hyson truly made the party magical and memorable for not only the kids, but the adults too! He is fantastic with the kids, gets everyone at the party engaged, and keeps things energetic and fun and educational. My party guests are still talking about how much fun the Mr. Hyson show was!! He was truly a hit and made the party a huge success!! Thank you so much Mr. Hyson - you made my son's first birthday party a fun and memorable event for all! Mr Hyson was so great.He made our party a success.Kids loved him and the parents too.My 2 year old daughter was completely engaged in his performance and the other kids had a blast too!! Will absolutely recommend him.No second thoughts!! He was also very polite and professional. Mr. Hyson is TOP Quality! As another children's performer I can tell you, Mr. Hyson's got what it takes to not just flawlessly entertain your children, but also present a gentelmanly, positive, energetic, funny, and extremely musical program. Yes, you want to hire him! Mr. Hyson performed today at my daughter's birthday celebration. He was wonderful. The kids sang and danced. Everyone, including the adults, participated. The lessons from each song was valuable and imperative for our children to embrace. Thank you, Mr. Hyson! Musical Fun with Me. Hyson is so fun!!!! Musical Fun with Mr. Hyson is amazing! Mr. Hyson keeps the children entertained and involved. They love using his fun props and singing along. Mr. Hyson's songs are a lot of fun and easy to learn. 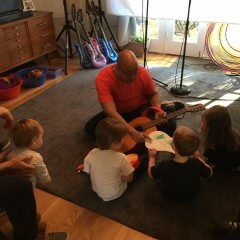 My preschool son loved having Musical Fun with Mr. Hyson for his birthday party. The songs are very creative and catchy. I offer a 45-60 minute full concert for the whole family. I play George, my guitar, as well as use upbeat background tracks during my performance. I like to instill positive messages, as well as give children opportunities to express themselves through, speaking, dance, singing, and acting. I use a variety of props including pom-poms, jump ropes, leis, real instruments, inflatable instruments, cones, hula hoops and cool sun glasses. You can also expect the children to use teamwork as they compete against me during the song, Ice Cream....it's going to be loud!! My name is Leroy Hyson and thank you for having an interest in Musical Fun with Mr. Hyson. I am an educator in the Montgomery County Public School System and have taught grades pre-k to 8. I have experience working with children for over 25 years and still enjoy seeing kids learn and grow at every age. When you hire me for an event you can expect professionalism, flexibility, and excitement. I offer a 45-60 minute full concert for the whole family. I play my guitar George, as well as use upbeat background tracks during my performance. I like to instill positive messages, as well as give children opportunities to express themselves through, speaking, dance, singing, and acting. I use a variety of props including pom-poms, jump ropes, leis, real instruments, inflatable instruments, cones, hula hoops and cool sun glasses. You can also expect the children to use teamwork as they compete against me during the song, Ice Cream....it's going to be loud!! 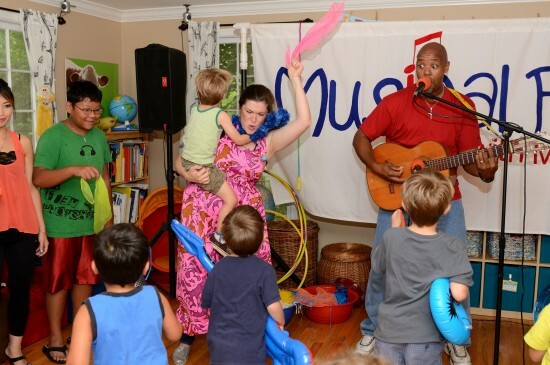 I've performed for numerous birthday parties in the Maryland, DC, and Virginia areas. I have also performed for the Columbia Academies, Montgomery County Public Libraries, Church of the Redeemer, Anne Arundel Libraries, Lake Forest Mall, and many other venues. I look forward to celebrating your next party and or event. I ask that adults be active in the performance and encourage the children as they attempt certain tasks. I would also like to have a 3-4 foot table available for my system. Other than that.... ENERGY!!!!! A huge influence on my music career is Bill Brennan (Billy B). He inspired me as a teenager when he performed shows where a taught. He uses music to teach children about natural science concepts. The main thing that influences me are the children I work with. 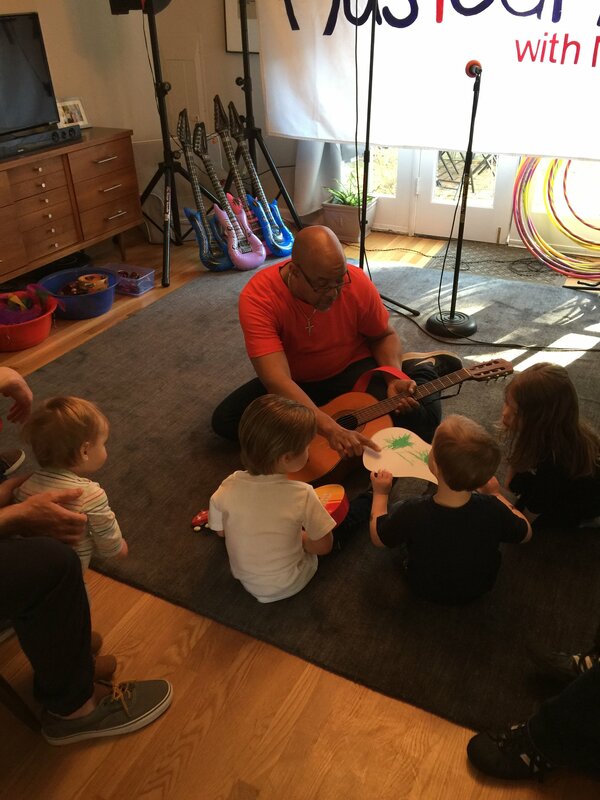 Most of my songs come from interactions with children, whether it's my own children, nieces, nephews, or my students. Stage area about 15 wide and 10 feet deep.